Transport chair is quick, safe transportation to and from vehicles, offices, shopping. 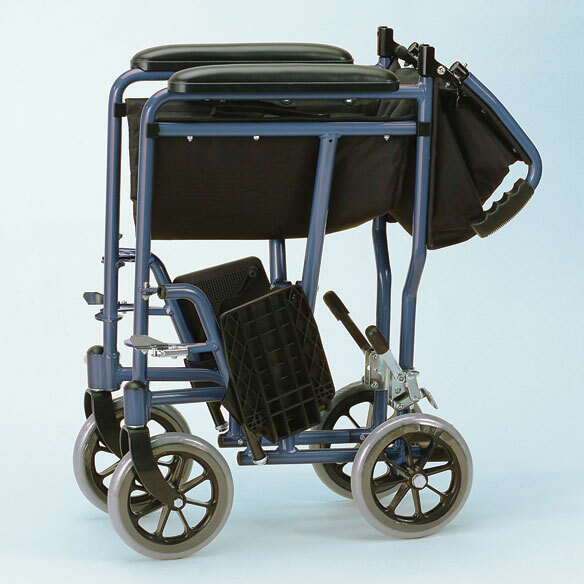 Canvas back folds; features dual, push-lock wheel brakes, seat- and foot-belts, removable, swing-away leg rests. 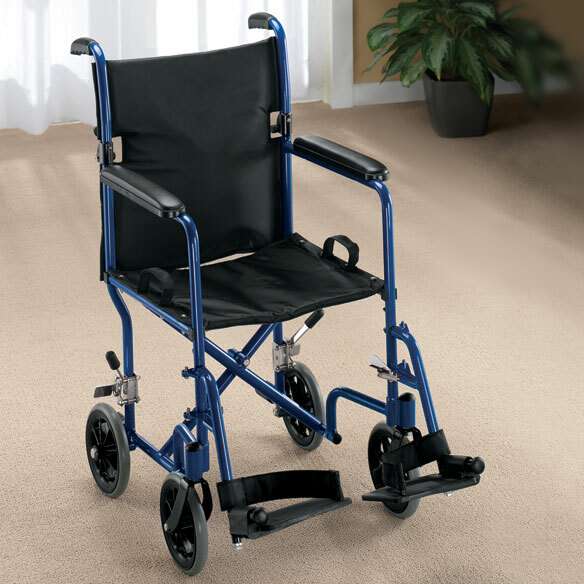 Transport chair is sturdy steel and arrives assembled to 30" x 23" x 10"; foot rests attach. Canvas seat is 19" wide; holds up to 300 lbs. Weighs 32 lbs. No express shipping. This chair has enabled my mom to travel with us and travel she has. It's so easy to collapse or set up that we never hesitate to take it and her with us. Unfortunatley the foot rests come off too easily and do so when it's not convenient (putting into trunk). Can't trust them with the airlines so we have to remove them and carry on with us. Need to have a cotter pin assembly to secure them yet allow quick removal as necessary. I'm working on designing just such a thing as we will be buying a 2nd chair for my husband. We rented a larger chair with big wheels which allows hand propulsion, but for most uses I like this smaller chair just as much. I can propel it with one foot around home, and it's relatively easy for my small wife to load it into the car. I was concerned it wouldn't be wide enough, but I fit it fine and find it comfortable. Sturdy construction, performs well. It is lightweight but hold up to 300 lbs. Because it looks comfortable, and folds up nicely. We like the convenience of this chair. My husband has Parkinson's Disease and I am his Primary Care Giver. I can neither stand long or walk far so I need the chair to get around the house, etc. to help him. The chair I had finally just gave out from age. It left me in a rough position. I hope the seat is strong and will hold up for a long time. Most chairs are either too wide or too weak - this one looks like the one I had before and it was a good one. Thank You. I got this for my mother who has limit mobility. I need a wheel chair that is light weight and compact and easy to handle. Someone is always falling at church. needed a light weight wheelchair for my aunt. Ease of use-foldable. Strictly need for transporting my Dad. I wanted something easy to help my parents be transported to doctors appointments and shopping. They have a walker but my mom has PAD and her legs are weak. I need to have both knees replaced.Until then ,I can walk a little, and ride a little. Hoping to make it easy to get my husband to join me on shopping and outings. Do the brakes engage automatically if you remove your hands? BEST ANSWER: Thank you for your question. The brakes do need to be manually engaged and released. We hope this information will be of help to you. how much does wheel chair weigh? BEST ANSWER: Thank you for your question. The Transport Chair weights 32 pounds. We hope this information will be of help to you.